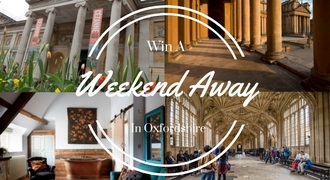 Stand a chance to win a weekend break in Oxfordshire! Enter the competition below for your chance to experience a weekend away in Oxfordshire. To be in with a chance of winning this exciting experience, simply complete and submit the form below in detail. Terms & Conditions: Entrants must be 18 or over. The Winner will be selected at random from all entries. Competition closes 31.12.18 at midnight. The winner and guest will get to stay one night at the Artist Residence. The winner will also receive two tickets to Blenheim Palace, Lunch at the Ashmolean Museum (up to £80), and 2 tickets for an Oxford Official Walking tour. Full Ts&Cs can be found at www.experienceoxfordshire.org. Subject to availability at the time of booking. Experience Oxfordshire reserves the right to change the details of the competition anytime.